New Jersey pugilists Fight Amp are in their eighth year of writing and performing metallic, punk-influenced noise rock. 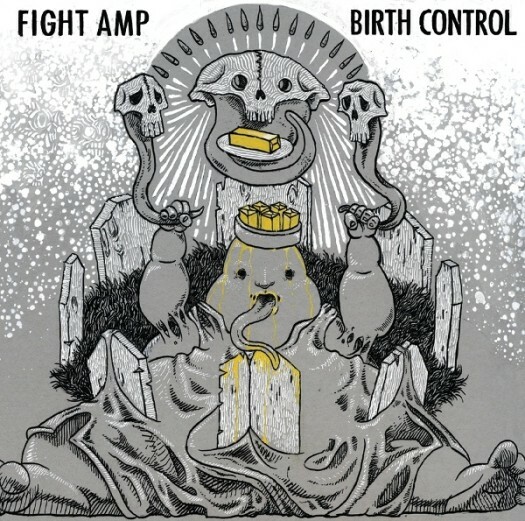 Their third full-length offering, Birth Control, is somewhat of a concept album that follows the narrative of an apocalyptic bildungsroman, as the main characters struggle through life, from adolescence 'til death, contending with social evils and the end of the world. With that story arc in mind, the record doesn't sound as heavy as you would expect. The drumming is nimble and heavy on the cymbals, evoking bottles breaking one moment and ice floes cracking apart the next. The bass lines bring most of the weight and a sludgy texture to the mix, whereas the guitars often break off, swarm and fracture, attacking the listener like an angry cloud of bees convinced you just took a bat to their hive. The vocals have a wailing quality, channelling more disappointment than rage, a tribute to that peculiar, contemporary, defeatist mindset that combines defiance with complete cynicism. "Should've Worn Black" is an album highlight, with the most texture and meat to the sound, the grooviest rhythms. All taught muscle and frustrated energy, Birth Control is a lean engine chugging inexorably towards hopelessness.